Been diving in Japanese Garden? Please Vote! The Japanese Gardens in Koh Tao is one of the most famous dive sites in the region and throughout Thailand. Although there are many reasons that the Japanese Gardens are so popular, the shallow, pleasant waters provide ideal diving conditions for beginners and many new divers will have their first underwater experience in the Japanese Gardens. Located on the East side of Koh Nang Yuan, the site only has a maximum depth of 15 metres and offers sandy patches with large boulders covered in cool coral formations. An abundance of marine life welcomes the many divers that choose to dive at the Japanese Gardens on a daily basis as diving is possible all year long. 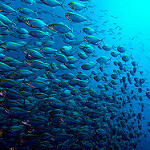 Expect to see a number of angel fish, long-fin banner fish and wrasses. If there are titan triggerfish around, be sure to keep your distance as these can be very territorial. 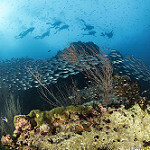 With a mini-wreck in the form of a recently-sunk dive boat, the site is host to a number of turtles, puffer fish, emperor angel fish and butterfly fish. For those lucky enough, they may even spot a majestic eagle ray gliding by in the warm open waters. The site also offers great underwater photography opportunities for those interested in macro life such as critters that hide in anemones and hard and soft corals. Map of Koh Tao, Japanese Garden dive site.